Lor mee is one of the dishes I hardly eat because I'm not a big fan of starchy gravy. So this is only the first time I have tried this famous hawker at Old Airport Road. Xin Mei Xiang (新美香卤面) always draws one of the longest queues at the food centre. Gotta be curious whether it's good or not, right? 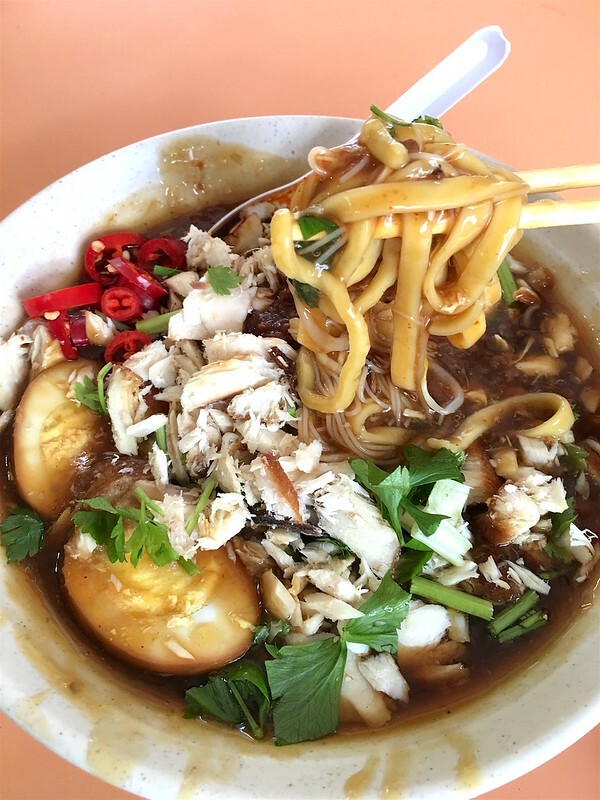 I wouldn't queue for lor mee, so I came here early one morning, and got my S$5 (large) bowl of piping hot braised noodles with less than 3 people in the line. I have to say it's pleasant enough but not mind-blowing. Fortunately, the gravy doesn't feel heavy or clumpy; it's got the right viscosity - fluid enough to not be cloying and just thick enough to coat the noodles. It isn't too heavy on Chinese herbs like at some places, but I actually like the herbal taste. The fried snapper topping is good but I hear sometimes it's not too fresh? I won't mind eating this again but I still wouldn't queue more than 10 minutes for this. Come before 11am and you won't have to.